Stardom has finally started to take advantage of the fact that there are lots of people that love collecting cards as this is already the fourth set they have put out in 2018. The sets aren’t always easy to get however, as two of those (the first 2018 set and the Io Shirai set) were never sold online. Luckily, they made enough of this set that I was able to buy some packs. This set celebrates Kagetsu’s 10th Anniversary since her wrestling debut. I purchased 35 packs so I have a pretty good feeling of what this set has to offer, lets go over some of the Pros and Cons. 10 cards per pack. This is the standard that Stardom has had for awhile but it still is worth noting as its a decent number of cards for one pack. Card pictures and variety. For a set that only features one wrestler, you’d think that the cards would get old, but they did a really good job here of having different types of base cards. The pictures on the cards range from early in her career, to her look outside the ring, to in-ring action, and also features pictures with her current faction Oedo Tai. Any fan of Kagetsu would be satisfied with the cards as presented. On card autographs. As an autograph card collector, its important to me that the autographs aren’t on stickers. Sometimes stickers are necessary but the cards look so much nicer without them so it is worth noting. Low autograph odds. While Stardom cards have never ‘guaranteed’ a hit (meaning an autograph, kiss card, etc.) per pack, you still could expect that at least 75% of all packs would have one anyway in their previous sets. That is definitely not the case here, as out of the 35 packs purchased, only 9 had an autograph card (so roughly 25%). That is far lower than any set produced by the promotion up to this point. It is also done completely randomly, so some people buying five packs may get four autographs, and someone else may get zero. Its one of the risks you take when buying cards from Stardom, but its more risky with this set than we have seen in the past. Can only purchase in bundles. The cheapest way to buy Stardom cards internationally is in a bundle of five packs for $50, so if you want to check out the cards the lowest amount you will pay is $65 with shipping. For someone that isn’t a serious card collector, that is a lot of money, especially for only five packs. It wasn’t an issue for me, but for casual fans it may be a little tougher to pull the trigger for that minimum cost. Only two autograph cards, no other special cards. Most Stardom sets have a variety of “hits” but this set is much more sparse. There are no dual autographs or triple autographs, which is unusual since Kagetsu is the leader of her own group that could have signed cards. There are also no kiss cards, memorabilia cards, etc. either. While I can not say with 100% certainty that there are no cheki cards since they aren’t numbered, I did not get one in the 35 packs I opened and have not seen any online. For such a large set, it is disappointing that only two different autograph cards were offered. Difficult to complete a set of cards. Even though the set only has 54 cards, since the cards are put into packs randomly, it is still hard to get a complete set if that is your goal. Of the 35 packs I purchased, I was only able to make two complete sets. If you want to get all the cards you will likely need to buy at least 20 packs to start, and then hope for a bit of luck too. Overall, this set was designed for mega fans of Kagetsu, and it shows in the presentation. 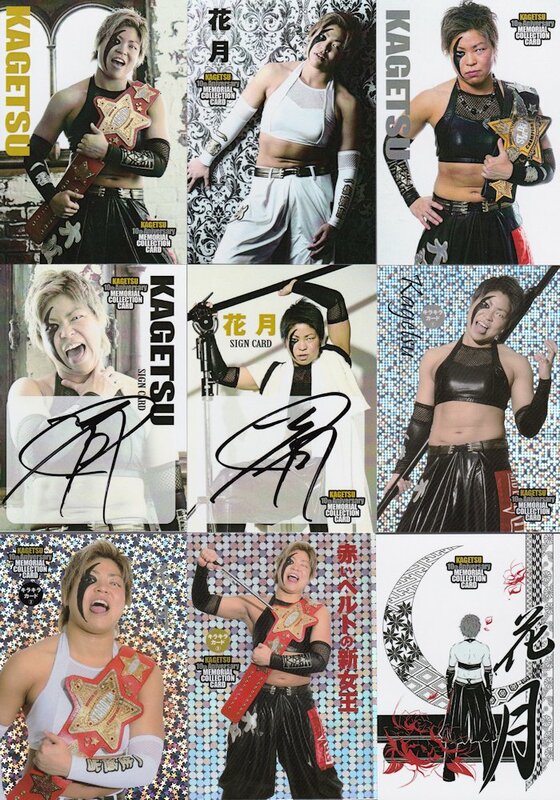 The cards themselves are quality, with bright professional pictures taken from different time periods in Kagetsu’s career (with a strong focus of her antics within the last year). But the “extras” that you’d expect from the major Stardom card releases aren’t there, with a low autograph pull rate and a general lack of special cards. While this set is a must for Kagetsu fans if you are a card collector, the average Stardom fan can just wait a few months for their main set as it will have a lot more to offer. Below I have scans of all the cards in the set, you can click on the images to make them larger. The wrestler-focused card sets created by Stardom are a newer creation, with this being the third one produced this year. The cards themselves are nicely done and there is certainly some value here, but its a hard ask for a casual fan to spend $65 on cards that may not have any autographs as that is a lot to spend on just base cards. Kagetsu fans will likely love it anyway, but for most Stardom fans it is probably save to pass.